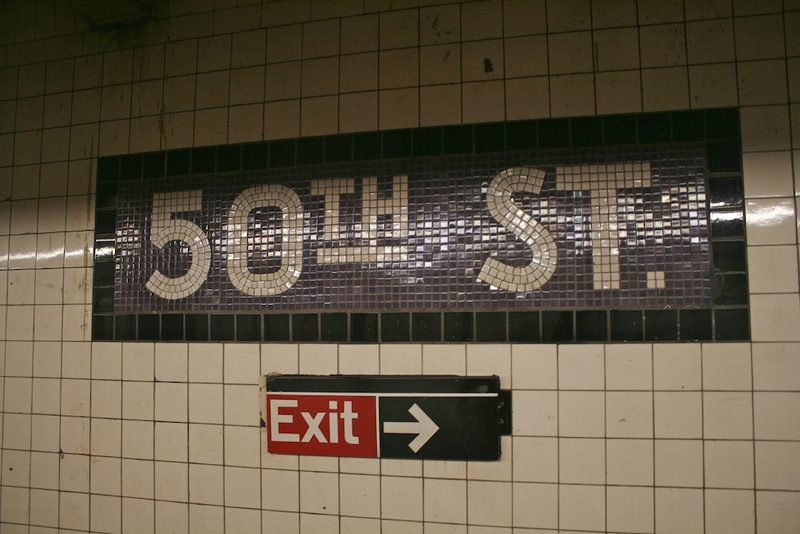 The two directions of 50 Street have such different complicated designs and there is no free transfer between directions (the street is the only way to change directions) so each side deserves its own section. 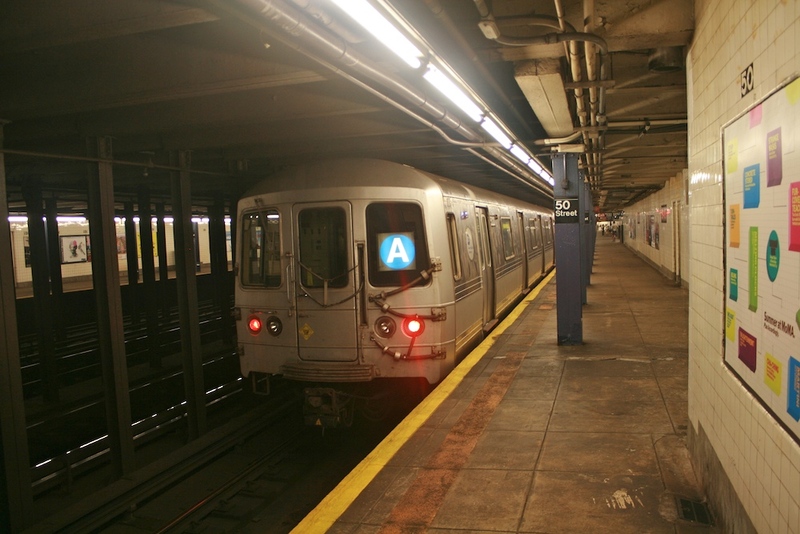 The E train is located on a lower level before the C train with the A's express tracks between them and the two levels are staggered. 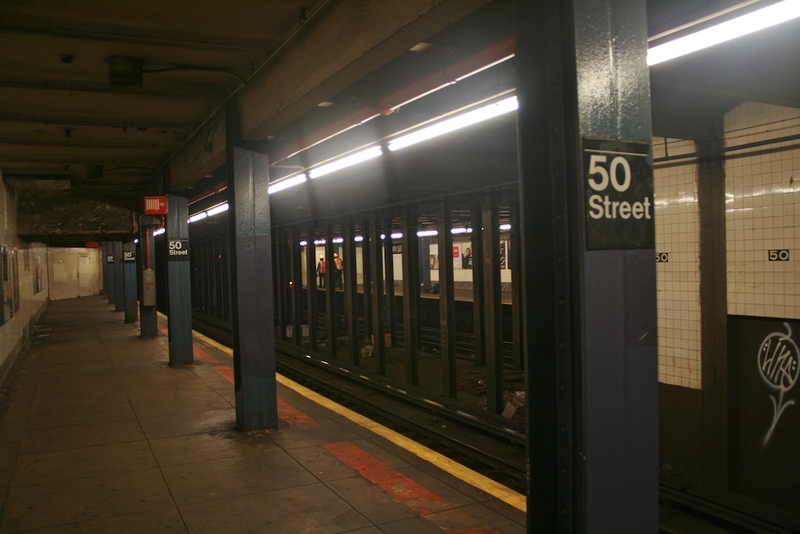 It is though the last stop where the C and E diverge from each other so automated announcements say "Transfer is available to the downtown C train." 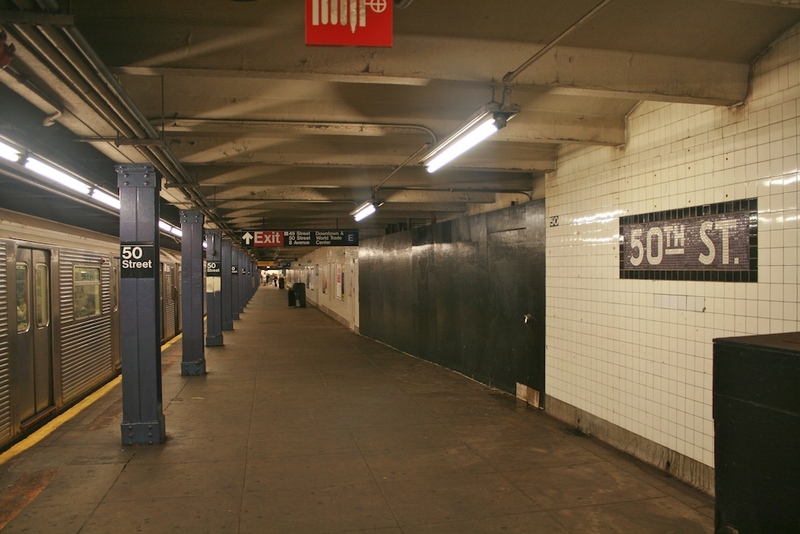 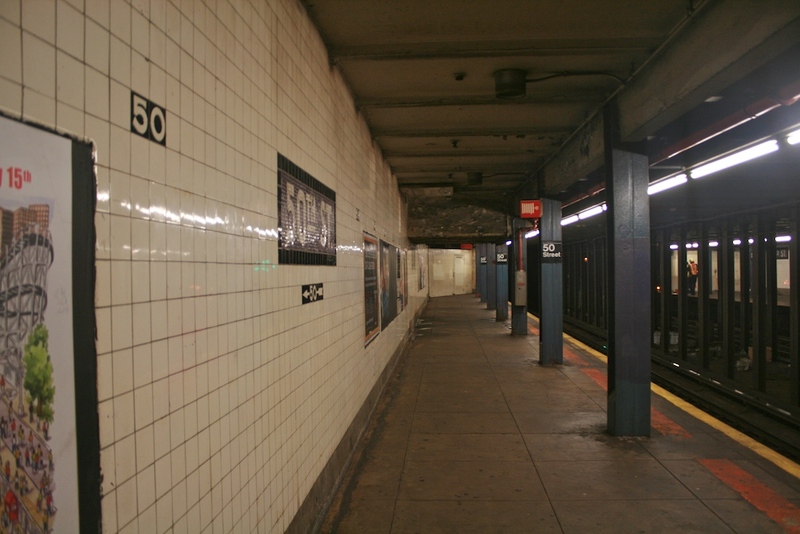 Both platforms have simple walls with blue background 50th St. name tablets and a no trimline just a line of 50s where the trimline should be. 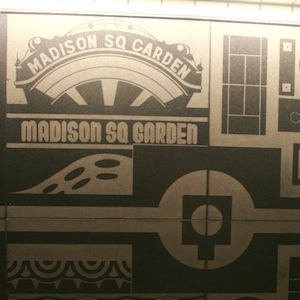 The downtown main entrances to the downtown side were extensively modified by the opening of Worldwide Plaza, an office tower in 1989, and it provided amenities like ADA access to both the upper and lower platforms. 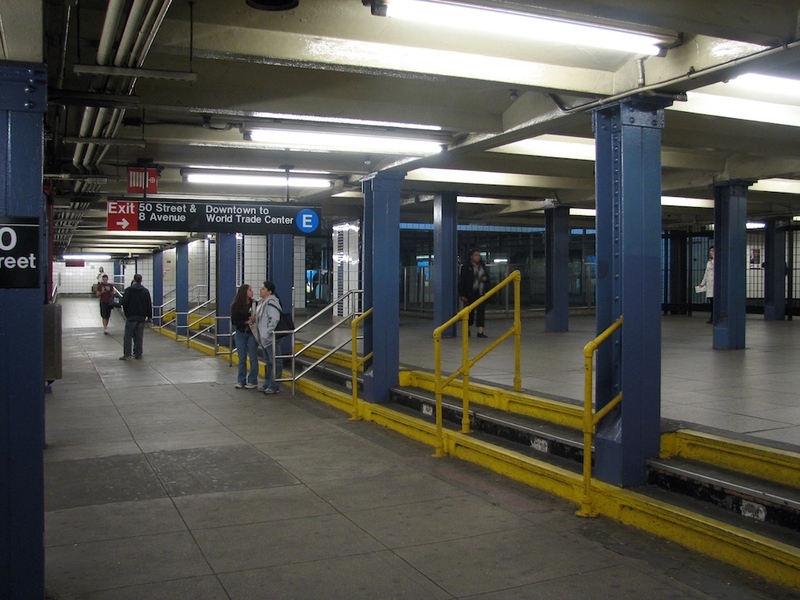 Starting from the south there are two conventional street stairs on near the SW corner of 49 Street and 8 Avenue. 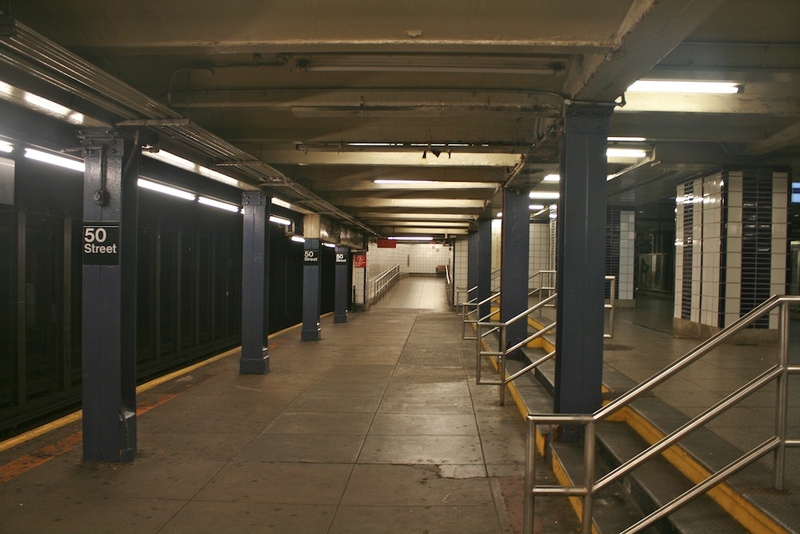 This leads to an underground passageway where there are two high exit turnstiles up from a staircase from the E train (splitting into two before the platform) that also connect to a separate passageway within fare control before both of these lead to the main bank of turnstiles where to the south there is a staircase and the E platform elevator and to the north is a staircase/up escalator from the E platform. 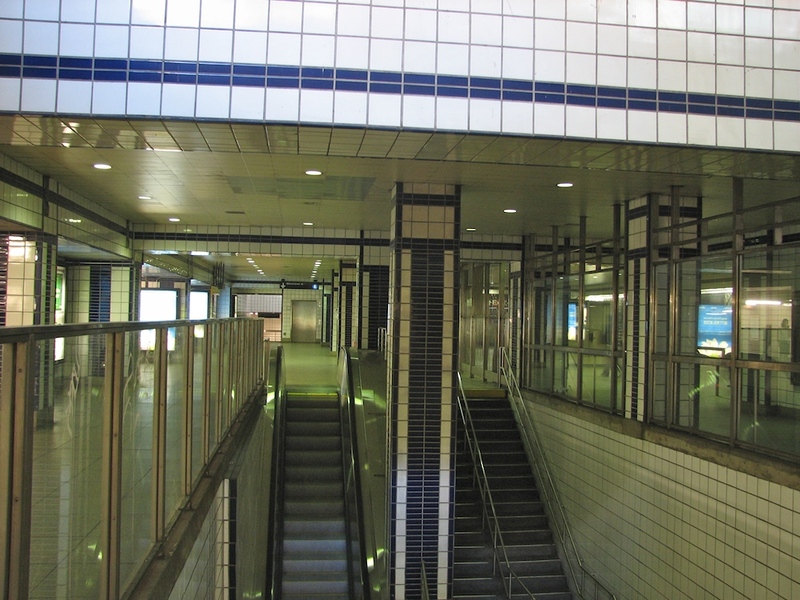 This is the ADA entrance and a ramp leads the few steps down to the C upper level platform at its extreme southern end. 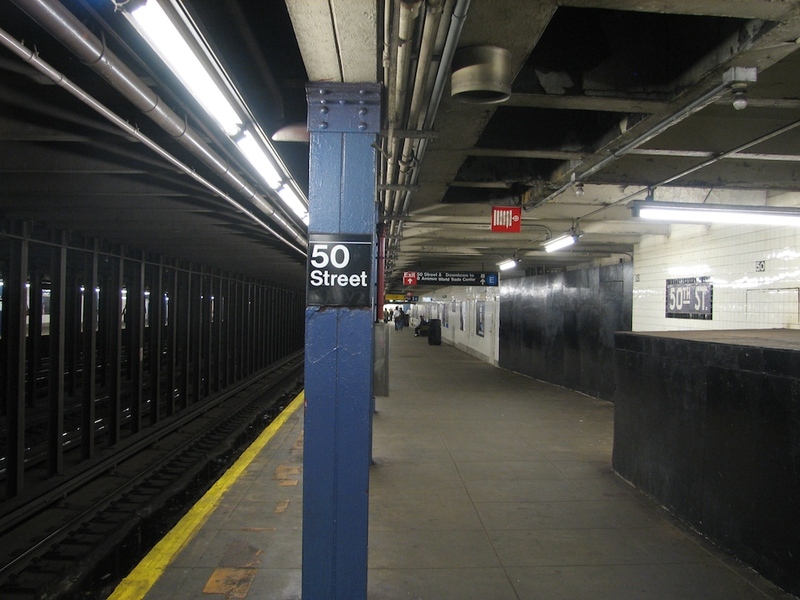 Just south of this fare control area the street elevator and a staircase lead down from Worldwide Plaza on 49 Street near the NW corner. 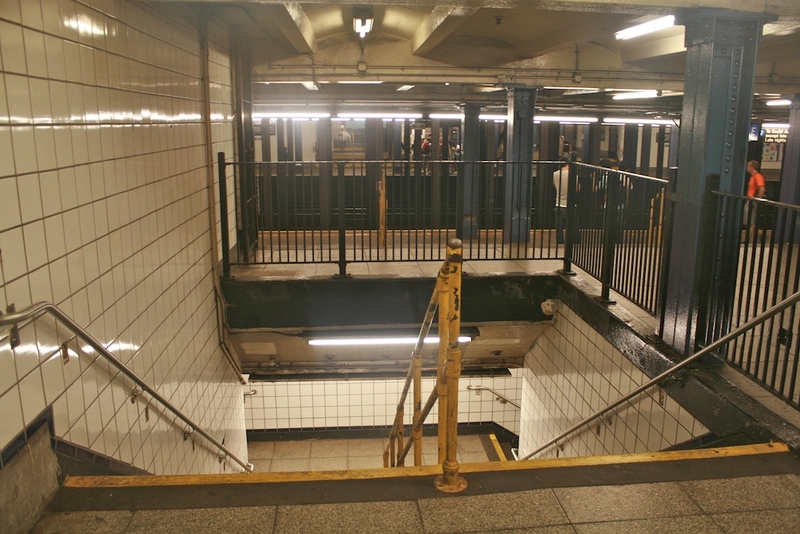 Outside of fare control there is next a staircase/up escalator inside Worldwide Plaza to the SW corner of 50 Street, followed by two more High Exit Turnstiles that connect to a few steps down to the upper level C train platform and a staircase down to the E platform in what was once the original fare control area. 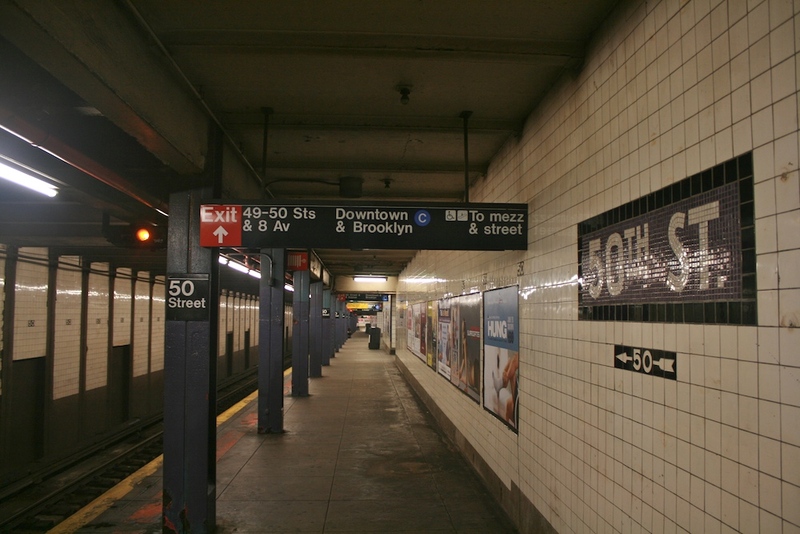 All at the southern end of the C platform There is a final entrance via a staircase inside the existing building on the NW corner of 50 Street and 8 Avenue. 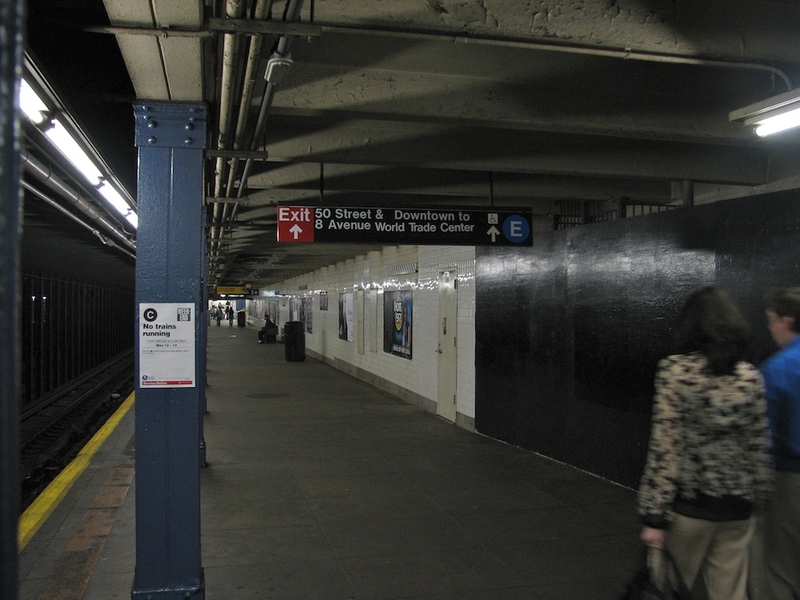 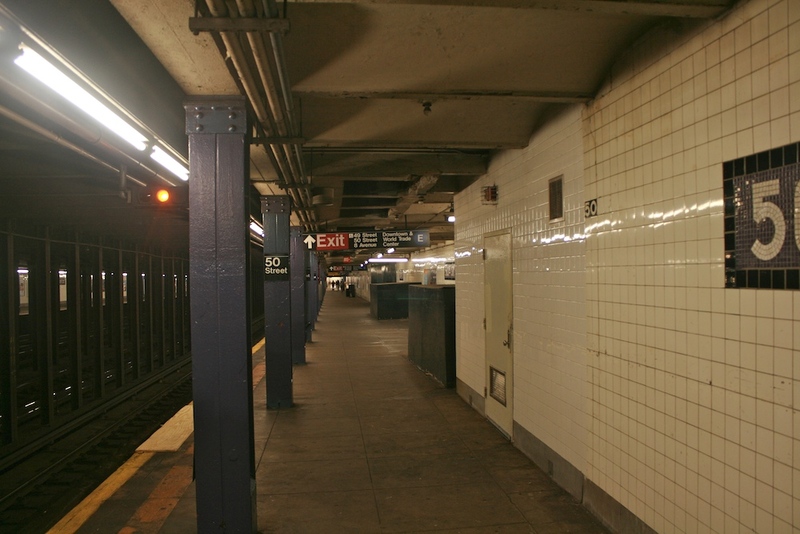 The upper level C platform marked by a plywooded off area on both the upper and lower level platforms (there was once a staircase down to the extreme northern end of the E platform) used to lead to an abandoned exit to the on the SW corner of 51 Street. 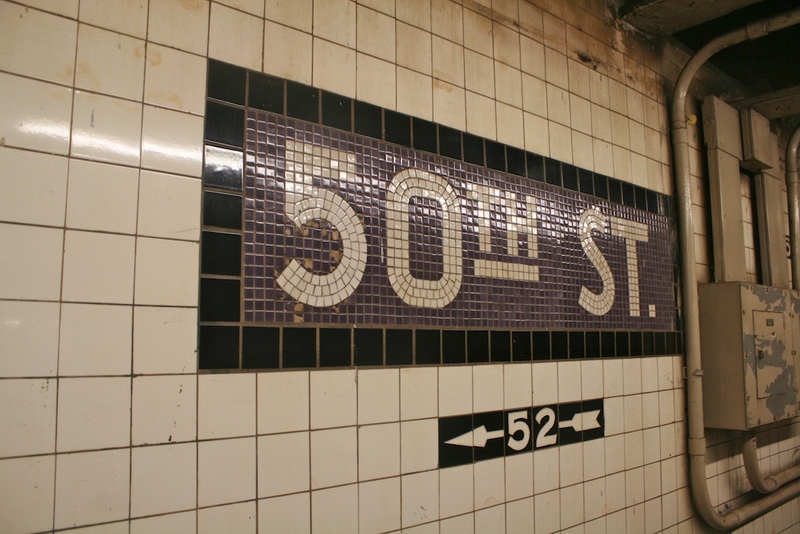 At the extreme northern end with one name tablet remaining with 52 written in an arrow beneath, this used to lead to exits at both the SW and NW corners (these are all based on the neighborhood map in the abandoned in-building entrance to the uptown side at the SE corner of 52nd and 8th). 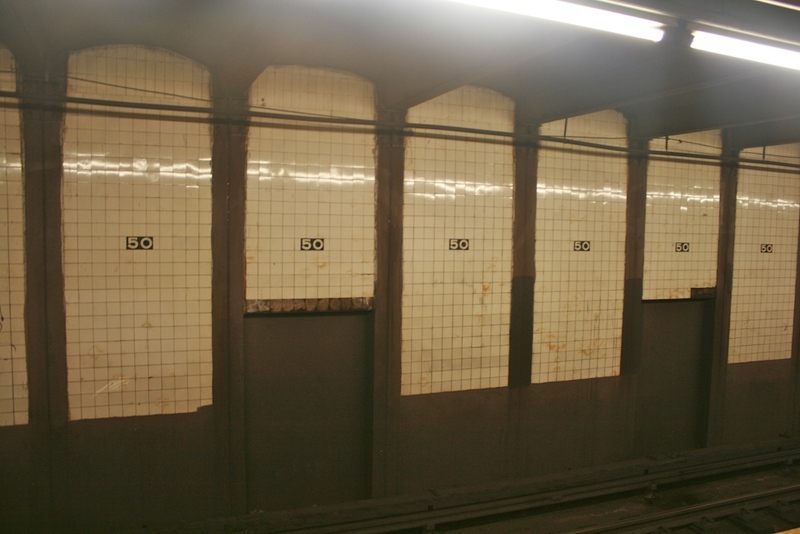 There are lots of name tablets, particularly on the upper level platform with either signage or paint blocking out their former exit arrows. 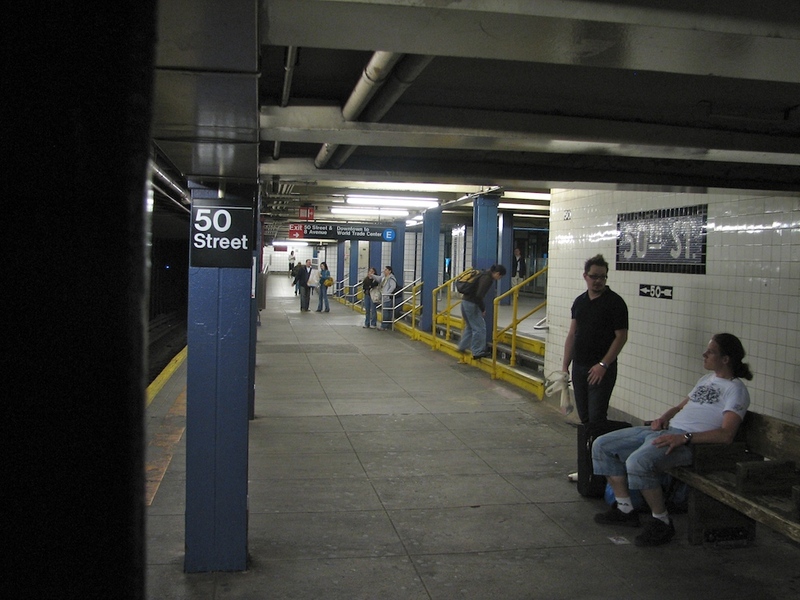 13 May, 2007 (50c_downtown3) Approaching the southern end of the upper level platform where the exit is, stair or ramp?